A 1963 Ferrari 250 GTO sold this past week for the unbelievable sum of $31,856,726 (£20.2 million), making it the most expensive car ever sold in Britain and the second most expensive car ever known to have been sold anywhere in the world. 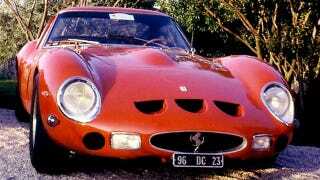 The 250 GTO in question was number 5095 and is believed to be the car purchased by British businessman Jon Hunt in 2008. Hunt purchased the Ferrari for a then world record $24.7 million (£15.7million). If the car is indeed Hunt's it would mean quite a significant profit ($7.09 million) on the car in only a few years. Although John Collins, chairman of well known high dollar classic Ferrari brokerage firm Talacrest, confirmed the GTO's sale price he would not confirm it was Hunt's car or that there was any truth to the rumor 5095 is on its way to Spain. John Hunt declined comment on the sale last week. With only 39 built between 1962 and 1964, we imagine we haven't seen the limit of Ferrari 250 GTO prices—as hard as that is to believe. This sale puts it awfully close to the most expensive car ever sold— a 1936 Bugatti Type 57SC that sold for somewhere in between $31 and $41 million in 2010.